One evening last year, east-bound traffic on Gibson Hill waits for a car turning left on Crocker Lane. Reversing a decision it made a year ago, the Albany City Council now says it does not want a full roundabout at the junction of Gibson Hill Road and Crocker Lane in North Albany. The council changed course at a work session Monday when it voted 5-1 to explore putting a traffic signal at the intersection. Councilman Bill Coburn, who made the motion, said he had in mind some kind of hybrid between two types of signal layouts considered by consultants David Evans and Associates (DEA) last year. One would be a single-lane traffic signal costing an estimated $538,000. The other would have turn lanes and cost nearly $1.9 million, according to last year’s DEA estimate. 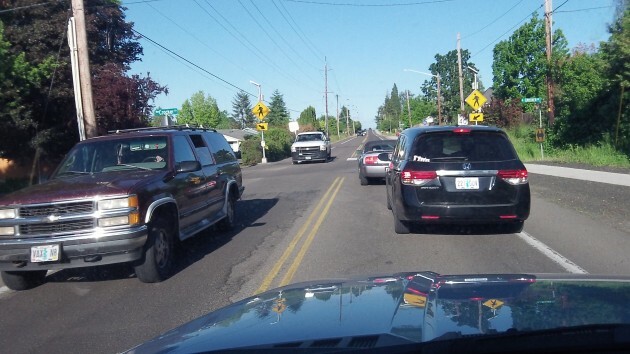 Coburn’s idea was that maybe, a signal arrangement with fewer turn lanes could be worked out. Councilman Ray Kopczynski voted against signals. He wanted to stick with plans for a full roundabout, which DEA estimated would cost $1,463,000. A full roundabout would take up a good portion of the residential lots on both corners of the junction. Councilwoman Bessie Johnson says she doesn’t want to take people’s property, and most of her colleagues appear to agree. The family living on one of the properties told the council they didn’t want to lose a big chunk of their corner but they could probably live with a smaller roundabout. Councilors Rich Kellum and Bessie Johnson proposed a “mini-roundabout,” which would take far less property, but the council voted 4-2 against that. Roundabouts do work, but either most cars in North Albany do not have turn signals or the drivers have not read the ODOT drivers manual regarding proper procedure to exit a roundabout. A traffic light will do the favor of attempting to slow down the speeds on Gibson. I think this decision is a big mistake. Stop lights will cause significant bottlenecks and backed up congestion. There will be needless stopping in all directions increasing hazard and wasting gas. Roundabouts are so much more efficient. Everyone merges peacefully and traffic flows in all directions. Only occasionally does one need to come to a complete stop. I think the mini-roundabout sounds like a good option. Either mini or full, I think the round about is the best answer. Do you live near the North Albany roundabout? I invariably have to come to a complete stop when trying to make the turn from Gibson Hill to North Albany Road. Either because of the speeders flying out of the neighborhood north of the roundabout, or the cars in front of me yield to others when they should not. It is a huge annoyance I don’t want to see repeated at Crocker. I use the same roundabout everyday. Even during busy morning and evening commutes, I almost never have to stop. Your experience seems to indicate that you are not using the roundabout correctly. Even if that is the case, it is far better than sitting at a red light with no cross traffic, which will certainly happen when one is installed at this intersection. Just got back from Europe. Roundabouts are very functional there, and I would guess, require far less maintenance there and here. We need to think long term when looking at the options. It is a shame there is not more land to work with. Good point. But these are popular in say the old west gernany. That is about our size and a order of magnitude more people. My guess is that maintenance on a roundabout is less than a traffic signal. Assuming one percent interest, what is the current dollar cost of the alternatives graphed out to a 100 years? Is the real difference land acquisition costs? A stop light!? I’d rather leave it as is. Worth a try. Better than the green to yellow to red. Repeat. Great idea on the 4 way stop Hasso. That could be a immediate improvement on the problem intersection. If we wait for all the studies and engineering, we will be waiting on Crocker to get onto Gibson Hill for many years to come. Put the stop signs in and then study what to do for the next step of improvement. Makes sense, ah? If they must screw this up and install a light, it would be considerate, at least, to have it set to flash yellow during off-peak hours. Else we will all be sitting at red lights with no cross traffic– especially those approaching the intersection from Crocker. I’m disappointed in this decision, as I believe a roundabout would work far more effectively than a traffic light at this location, especially by keeping traffic moving when it is not busy. My one regret with a roundabout was the extent of needed property acquisition… not ideal for the property owners. As I recall, though, the traffic signal with turn lanes also required substantial acquisition. A signal without a turn lane on Crocker would be unfortunate. place where taken land will not effect so much. And what is the latest on the north albany grocery store? I love roundabouts. Stop signs would be my second choice. How about asking a traffic expert about the pros and cons of each? Burbank had an expert years ago, and he told me the reason a stop was unwise on a road I traveled. He made sense. Do the stop signs now. I too want more news on the grocery store. I live adjacent and haven’t seen much activity.